Squeee! 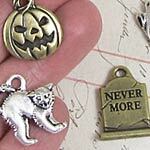 See all the Halloween Charms on the blog! Information on materials and finishes: Antiqued gold-, silver- or copper-plate over cast pewter (or brass oxide or black oxide over cast pewter). All pewter is lead free and made in USA.